Alas here I am again, late. Sigh. This past week was difficult for me, for all kinds of reasons, including the fact that I have always found February very hard. Although it may be the shortest month of the year, it always has felt like the longest month to me. Once March arrives the days are so much longer and it feels like spring is coming so it is not so bad, but February… its just hard. I am really looking forward to a short trip to Vancouver Island in early March to visit with my family there. That is getting me through, as is this lovely hellebore plant my husband gave me for Valentines. 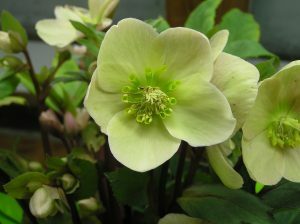 I adore Hellebores. I “bumped up” my lisianthus seedlings this past week, as the first set of true leaves were appearing and roots were starting to emerge through the bottoms of the blocks. They are now all in roomier abodes in 2 inch soil blocks. So for those interested (i.e. me), that was approximately 4 weeks from seeding to bumping up. But the high point was actually the soil ecology- see the next section. All the seedlings potted on are doing great. However, tragedy has struck my Lupinus perrenis seedlings. They are slowly dying off. I have two left now, one of which looks like it is going to give up the ghost soon, the other, looking very pale- but I still have some hope. I cannot imagine what has happened to these seedlings. I am distraught. I sure hope the ones planted in jugs outside germinate and thrive when April comes around, otherwise, it will be a complete loss on the perennial lupine front. February is also rough because I have now run out of BBC Gardeners’ World reruns to watch, the wait until the first new episode of 2019 is agony! Okay, okay maybe I am being a bit melodramatic, but I do have a serious addiction to this program, there is nothing to compare to it coming out of North America as far as I can tell. If you are like me, finding a movie/show that is worth the precious relaxation minutes of your life is really hard. We did take in a great Netflix documentary called “Sky Ladder: The Art of Cai Guo-qiang”. This was worth watching for sure. Some amazing footage and interesting things to learn about China and this artist. On the podcast front, my favorite this week was from CBC Ideas on the issue of the future of work http://www.cbc.ca/radio/ideas/less-work-and-more-leisure-utopian-visions-and-the-future-of-work-1.4306410. This one is part of a series I have listened to, and this is the best of the 3. If you have any interest in social justice in the economics of work, a basic income and the ideas of experts on these issues, this one is for you. Hope you have a great week, see you here next week!